Futures Forum: Climate change: will Carbon Capture and Storage be the techno-fix to 'unlock' unburnable fossil fuels? Climate change: will Carbon Capture and Storage be the techno-fix to 'unlock' unburnable fossil fuels? Can we 'fix' climate change? Futures Forum: The techno-fix ... Can we engineer our way out of environmental catastrophe? Or ... Can we 'design for the real world'? Futures Forum: Techno-promises unfulfilled >>> Where did the future go? Refining Carbon Capture and Storage (CCS) techniques would unlock the use of "unburnable carbon" as a viable energy source that would still keep the world on a 2C pathway if coupled with renewable energy, new research has suggested. Research from Imperial College’s Sustainable Gas Institute (SGI) has claimed that in order to meet climate targets established in Paris by the end of this century, enhanced CCS technology should be utilised to enable “unburnable” fossil fuel resources to be unlocked. SGI’s director, professor Nigel Brandon said: “This report shows us a way forward, which may enable us to continue to use fossil fuels as an important part of the energy mix, while remaining in the 2°C limitations. That said, we won’t get there unless there is greater support from governments for adopting CCS, together with more investment in improving CCS technology to reduce its residual carbon dioxide emissions. The concept of “unburnable carbon” – which first emerged in 2011 – argues that if all known fossil fuel reserves were depleted then carbon emissions would exceed the global carbon budget. But with 175 countries signing the Paris Agreement, the new white paper argues that fossil fuels could still be utilised in a low-carbon transition. The white paper argues that if CCS technology – which has a capture rate of around 85% - could be enhanced to around 95%, up to a third more of the world’s fossil fuel reserves could be unlocked without exceeding the 2C goals established in Paris. The research, which also calculated that global underground storage capacity for carbon could reach more than 31,000 gigatonnes, also revealed the barriers that would need to be mitigated in order to enhance CCS technology to a level viable for the report’s outcomes. According to the researchers, the costs of implementing CCS would need to be regulated to become more commercially viable, while “major gaps” in the supply chain and policy arrangements – which has seen the UK scrap a £1bn CCS competition – would also need to be remedied. While DECC is still suffering from the public backlash against the decision to scrap the CCS competition - which could add £1bn-2bn a year to the cost of decarbonisation throughout the 2020's – industries are beginning to turn to carbon capture to lower emissions. CCS techniques – which could “service many parts of mainland Europe” – are already being utilised by fossil fuel giant Statoil, which is carrying out feasibility tests at three locations on the Norwegian Continental Shelf. With the cement and steel industries in need of an “urgent” introduction to CCS technologies, a“breakthrough” technology - backed with a €12m fund from the European Union - has been unveiled to help the construction industry reach ambitious 2050 emissions reductions targets. The majority of fossil fuel reserves are unburnable if the world is to avoid dangerous climate change, but carbon capture and storage (CCS) could “unlock” greater use, a new study concludes. The white paper, from Imperial’s Sustainable Gas Institute, challenges previous findings that CCS makes little difference to the quantity of fossil fuels that can be burned, within a 2C carbon budget. Carbon Brief runs through the report’s findings and what it might mean for fossil fuel firms. CCS has a decidedly mixed reputation. Some strongly support it, whereas many view it with suspicion, as a technological fix that promises to allow existing energy firms to continue business as usual. Indeed, oil and gas majors, such as BP, Shell and ExxonMobil, are among the loudest CCS advocates. So it’s worth noting that the Sustainable Gas Institute was set up in 2014 with an £8.2m grant from oil and gas firm BG Group, which was recently bought by Shell. Note that this explicitly frames the question in terms of enabling access to more fossil fuels, rather than in terms of securing the energy the world needs while avoiding dangerous climate change. Fossil fuels are useful, but using them is not an end in itself. In contrast, bodies such as the Intergovernmental Panel on Climate Change (IPCC) have asked if the world could limit warming to 2C without CCS (the IPCC says it could), and whether the alternatives would be more costly (the IPCC says it would cost twice as much without CCS). Moving on from how it chooses to frame the issue, the Sustainable Gas Institute report follows a well-worn path that starts with the carbon budget. This is the amount of CO2that can be released for a given chance of remaining below a chosen temperature limit. For instance, the IPCC says cumulative emissions must be no more than 1,300bn tonnes of CO2 (GtCO2) after 2011, for a 50-50 chance of staying below 2C. This is much less than the 3,683GtCO2 that would be released if all fossil fuel reserves were burned, leading to the concept of “unburnable” carbon. An influential paper published last year found more than 80% of coal reserves, 30% of oil and 50% of gas is unburnable if the world is to avoid warming of more than 2C. This paper also said that CCS made little difference to the share of fossil reserves that would be unburnable. The new report challenges this argument. While it agrees that CCS allows only a relatively modest increase in the use of fossil fuels before 2050, it finds a much larger impact by 2100: two-thirds of known reserves could be burned, if CCS is available, compared to just one-third without. Share of known fossil fuel reserves that could be burned within a 2C carbon budget (GtCO2 and %). Note that the totals include cumulative emissions from coal, oil and gas between 2005 and 2050 or 2100. Without CCS, the amount of burnable carbon to 2100 is similar to the remaining carbon budget for a 50/50 chance of remaining below 2C, see above. Source: Sustainable Gas Initiative white paper. The impact is particularly large for coal and gas, the study says. That’s because centralised coal- or gas-fired power stations could be fitted with CCS, whereas oil is used in millions of vehicles where carbon capture would be impractical. 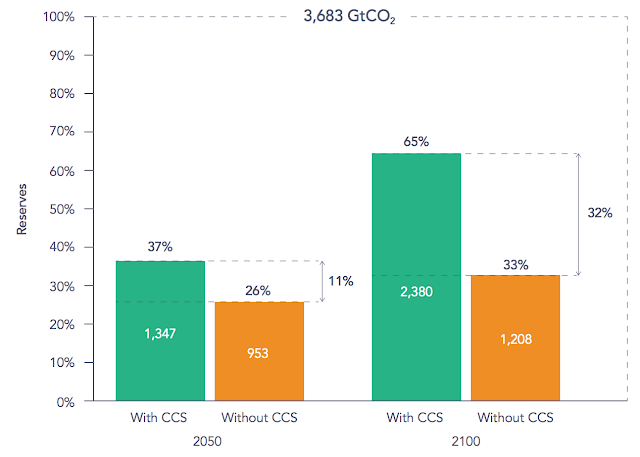 Gas equivalent to 150% of current reserves could be burned by 2100 if CCS is available, it says, compared to 68% without CCS. For coal, the fraction of reserves that can be burned also more than doubles from 14 to 32%. The amount of gas that could be burned within a 2C carbon budget would rise even further, the report suggests, if CCS technology could be improved. CCS doesn’t capture all of the CO2 emitted: in general, the higher the share captured, the more expensive it becomes. Most models assume CCS would only capture 85-90% of emissions. This is a key constraint on the use of CCS because emissions need to fall to net-zero if global temperatures are to be stabilised. Even a 90% reduction in the CO2 emitted by fossil fuel burning might not be enough to get there. If the capture rate could be increased to 95% or more, the report says, then the amount of gas that could be burned by 2100 would roughly double. Before asking what the new findings mean, it’s worth raising an important caveat, which is that the study is based on the remaining carbon budget for a 50-50 chance of limiting warming to below 2C. Many would prefer to aim for a likely chance — a 66% probability — of remaining below 2C. Moreover, the 2C limit is out of step with the Paris climate agreement, which says warming should be kept “well below” 2C and that efforts should be made to hold temperatures 1.5C above pre-industrial levels. Meeting these aims would entail sticking within a smaller carbon budget, which in turn would mean much less of our fossil fuel reserves are “burnable”. The fact that CCS captures less than 100% of CO2emissions becomes more of a problem, if the carbon budget is tightened. In terms of what the results mean for fossil fuel firms, this timeframe is significant, because investment decisions tend not to look further than a couple of decades ahead. After sketching out a below-2C scenario for the first time last week, Shell said it had “no immediate plans to move to a net-zero emissions portfolio over our investment horizon of 10–20 years”. He adds that there are “many outstanding questions” about the modelled findings based on today’s assumptions of the future cost and availability of technologies. Another issue is that some experts argue against using CCS to decarbonise power stations, saying it should be reserved for industrial uses, or negative emissions. This seems to get to the heart of the problem with CCS. Modellers tell us it is indispensable if we are to avoid dangerous warming cost-effectively, but that the upfront development costs will be high. Meanwhile, others warn it should not be seen as an excuse to continue business as usual. Given this context, and the fact that its potential benefits lies so far in the future, it is, perhaps, unsurprising that progress on developing the technology is stuttering in the UK, even if developments elsewhere show more promise. New Carbon Brief analysis shows just how quickly the carbon budget is running out, with around five years of current emissions remaining for a likely chance of staying below 1.5C. Main image: Fort McMurray, Alberta. Credit: Kris Krüg/DeSmogBlog. "Cronyism in the South West"
Join the Great British Bee Count! Neighbourhood Plan >>> fill in the questionnaire!